Ultra compact contactless payment terminal. 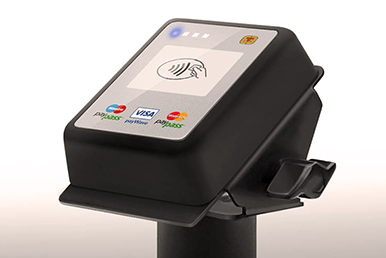 An ideal cashless payment solution for vending, parking, self-service kiosk, and transit fare collection. No additional hardware required. No PIN PAD (or, PIN entry) is required for low value contactless payments. No more problems with coins or banknotes, just tap and pay. Both EMV and MIFARE contactless standards are supported. No more closed-loop proprietary solutions. It is open for anyone who wants to pay with contactless card, NFC-capable mobile phone, or wearable NFC tag. This is all your need to boost your sale and accept payments with banking and transport contactless cards at your vending machine or self-service kiosk.